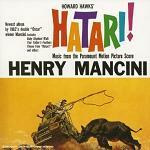 Henry (or "Hank") Mancini scored the music for numerous films from the 50s until the early 90s. During this time he frequently teamed up with director Blake Edwards. Perhaps because of this the films he worked on tended to be light-hearted stories, even the thrillers being more like romantic comedies, and his light Jazz style was very suited to this type of film. Although there are rarely any dark moments in Mancini's music, there is a wistful sadness to some of his songs. For these songs Mancini would frequently team up with lyricist Johnny Mercer, for example on "Breakfast at Tiffany's", "Days of Wine and Roses" and "Charade". 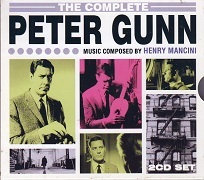 Mancini's musical background was in jazz bands, and before his work in films he spent a few years writing for TV series such as "Peter Gunn" and "Mr. Lucky". His background in swing bands made him ideally qualified for two of his earliest film scores "The Glenn Miller Story" and "The Benny Goodman Story". 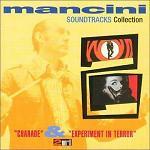 In these and other films, the Mancini style is frequently more akin to Big Band than the symphony orchestra sound. His orchestration will typically include a drumkit perhaps with brushes and a Latin percussion set, the lead tunes are very often played by Trumpet (think Herb Alpert) or Saxophone with occasional flute or voices, perhaps accompanied by bass, guitar, tuned percussion, and a tinkling Lounge Lizard easy-listening piano. The tunes may employ Latin rhythms or Blues-influenced chords and melodies, augmented with Jazz-style improvisation riffs on various solo instruments. Among the session players that worked regularly with Henry Mancini, were pianist/composer John Williams and bassist Abraham Laboriel. The one thing which makes Mancini's music memorable is simply the good tunes. In many ways a Mancini soundtrack is more a collection of tunes or songs rather the "background" music of other composers. This was intentional since Mancini (unlike most film composers) usually negotiated to retain the rights to his music in order to re-release it on albums. His facility as a tunesmith has produced theme songs (full of affection), and instrumental themes (full of humour) which people have been humming and whistling for decades. Among his many well-known tunes that have stood the test of time are items like "Peter Gunn" and "The Pink Panther", the song "Moon River" as used in "Breakfast at Tiffany's" and "The Baby Elephant Walk" from "Hatari!". 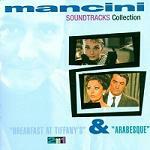 Mancini won 4 oscars: for Victor/Victoria (Adaptation or Original Song Score), "Days Of Wine And Roses" (Best Song), with Breakfast at Tiffany's winning both Drama or Comedy Score, and Best Song for "Moon River". "Henry Mancini: Reinventing Film Music" is a new book by John Caps looking at the film music of Henry Mancini. It is a comprehensive study of the composer's music, described "as a bridge between the Big Band period of World War II and the impatient eclecticism of the Baby Boomer generation, between the grand formal orchestral film scores of the past and a modern minimalist approach. Mancini's sound seemed to capture the bright, confident, welcoming voice of the middle class's new efficient life: interested in pop songs and jazz, in movie and television, in outreach politics but also in conventional stay-at-home comforts. As John Caps shows, Mancini easily combined it all in his music." John Caps served as producer, writer, and host for four seasons of the National Public Radio syndicated series "The Cinema Soundtrack", featuring interviews with and music of film composers. His book is available at Amazon.co.uk and Amazon.com. Breakfast at Tiffany's - with the unforgettable "Moon River"
The Pink Panther 1, 2, 3, 4, 5, 6, 7? - just how many sequels were there? 10 - co-writing the song "It's Easy to Say"
Peter Gunn - this was also used in "The Blues Brothers" movie and elsewhere, as well as the main theme you might come across tracks called "Fallout! ", "Dreamsville" and "Timothy"
Mr. Lucky - among the many recorded tracks from this series there's one called "March of the Cue Balls"
The Thorn Birds - another easily likeable theme tune showing a certain Celtic heritage, and Meggie's tune called "Anywhere the Heart Goes"
The Peter Gunn theme is reputed to be the first ever use of Jazz for television theme music. The New Henry Mancini Songbook - which has no less than 89 songs in it!